Effective network planning is essential to cope with the increasing number of mobile broadband data subscribers and bandwidth-intensive services competing for limited radio resources. Operators have met this challenge by increasing capacity with new radio spectrum, adding multi-antenna techniques and implementing more efficient modulation and coding schemes. However, these measures alone are insufficient in the most crowded environments and at cell edges where performance can significantly degrade. Operators are also adding small cells and tightly-integrating these with their macro networks to spread traffic loads, widely maintain performance and service quality while reusing spectrum most efficiently. One way to expand an existing macro-network, while maintaining it as a homogeneous network, is to “densify” it by adding more sectors per eNB or deploying more macro-eNBs. However, reducing the site-to-site distance in the macro-network can only be pursued to a certain extent because finding new macro-sites becomes increasingly difficult and can be expensive, especially in city centres. 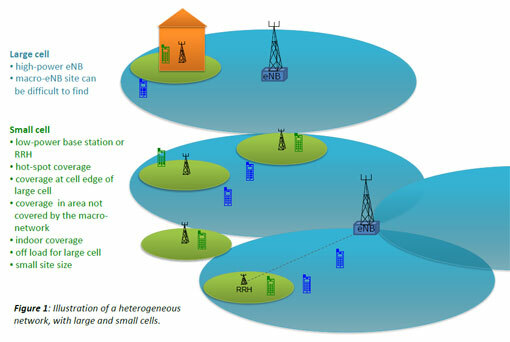 An alternative is to introduce small cells through the addition of low-power base stations (eNBs, HeNBs or Relay Nodes (RNs)) or Remote Radio Heads (RRH) to existing macro-eNBs. Site acquisition is easier and cheaper with this equipment which is also correspondingly smaller. Small cells are primarily added to increase capacity in hot spots with high user demand and to fill in areas not covered by the macro network – both outdoors and indoors. 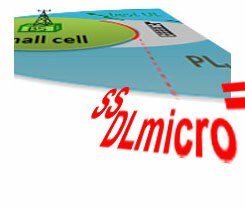 They also improve network performance and service quality by offloading from the large macro-cells. The result is a heterogeneous network with large macro-cells in combination with small cells providing increased bitrates per unit area. See Figure 1. Heterogeneous network planning was already used in GSM. The large and small cells in GSM are separated through the use of different frequencies. This solution is still possible in LTE. However, LTE networks mainly use a frequency reuse of one to maximize utilization of the licensed bandwidth. In heterogeneous networks the cells of different sizes are referred to as macro-, micro-, pico- and femto-cells; listed in order of decreasing base station power. The actual cell size depends not only on the eNB power but also on antenna position, as well as the location environment; e.g. rural or city, indoor or outdoor . The HeNB (Home eNB) was introduced in LTE Release 9 (R9). It is a low power eNB which is mainly used to provide indoor coverage, femto-cells, for Closed Subscriber Groups (CSG), for example, in office premises. See Figure 2. Specific to HeNBs, is that they are privately owned and deployed without coordination with the macro-network. If the frequency used in the femto-cell is the same as the frequency used in the macro-cells, and the femto-cell is only used for CSG, then there is a risk of interference between the femto-cell and the surrounding network. The Relay Node (RN) is another type of low-power base station added to the LTE R10 specifications. The RN is connected to a Donor eNB (DeNB) via the Un radio interface, which is based on the LTE Uu interface. See Figure 2. When the frequencies used on Uu and Un for the RN are the same, there is a risk of self interference in the RN. From the UE perspective the RN will act as an eNB, and from the DeNB’s view the RN will be seen as a UE. As also mentioned, RRHs connected to an eNB via fibre can be used to provide small cell coverage. Introducing a mix of cell sizes and generating a heterogeneous network adds to the complexity of network planning. In a network with a frequency reuse of one, the UE normally camps on the cell with the strongest received DL signal (SSDL), hence the border between two cells is located at the point where SSDL is the same in both cells. In homogeneous networks, this also typically coincides with the point of equal path loss for the UL (PLUL) in both cells. In a heterogeneous network, with high-power nodes in the large cells and low-power nodes in the small cells, the point of equal SSDL will not necessarily be the same as that of equal PLUL. See Figure 3. A major issue in heterogeneous network planning is to ensure that the small cells actually serve enough users. One way to do that is to increase the area served by the small cell, which can be done through the use of a positive cell selection offset to the SSDL of the small cell. This is called Cell Range Extension (CRE). See Figure 4. A negative effect of this is the increased interference on the DL experienced by the UE located in the CRE region and served by the base station in the small cell. This may impact the reception of the DL control channels in particular. ICIC was introduced in R8. The eNBs can communicate using ICIC via the X2 interface to mitigate inter-cell interference for UEs at the cell edge. The X2AP message used for this is called “Load Information”. See Figure 5. Through the “Load Information” message an eNB can inform neighbouring eNBs about: UL interference level per Physical Resource Block (PRB); UL PRBs that are allocated to cell edge UEs, and hence are sensitive to UL interference; and if DL Tx power is higher or lower than a set threshold value. The eNBs receiving these messages can use the received information to optimize scheduling for UEs at cell edges. ICIC has evolved to better support heterogeneous network deployments -- especially interference control for DL control channels. Enhanced ICIC (eICIC) was introduced in LTE R10. The major change is the addition of time domain ICIC, realized through use of Almost Blank Subframes (ABS). ABS includes only control channels and cell-specific reference signals, no user data, and is transmitted with reduced power. When eICIC is used, the macro-eNB will transmit ABS according to a semi-static pattern. During these subframes, UEs at the edge, typically in the CRE region of small cells, can receive DL information, both control and user data. The macro-eNB will inform the eNB in the small cell about the ABS pattern. See Figure 6. ICIC is evolved in LTE R11 to further enhanced ICIC (feICIC). The focus here is interference handling by the UE through inter-cell interference cancellation for control signals, enabling even further cell range extension. eICIC and feICIC are especially important when Carrier Aggregation (CA) is not used. Carrier Aggregation (CA) is introduced in R10, with backward compatibility to R8, to increase the total bandwidth available to UEs and hence their maximum bitrates. When CA is used a number of R8 carriers, referred to as Component Carriers (CC), are aggregated and any CA-capable UE can be allocated resources on all CCs, while R8/R9 UEs can only be allocated resources on one CC. Cross-carrier scheduling is an important feature in heterogeneous networks. Using cross-carrier scheduling it is possible to map the Physical DL control channels (PDCCH) on different CCs in the large and small cells. See Figure 7. 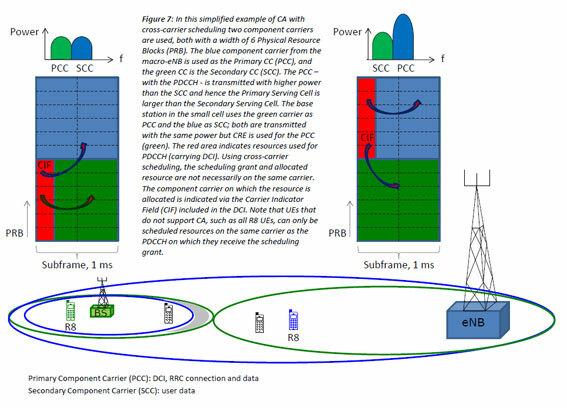 The PDCCH, carrying DL Control Information (DCI) with scheduling information, must be received by the UEs at the cell edge; PDCCH may be transmitted with higher power than the traffic channels. Hence, using different carriers for the PDCCH in the large and small cells reduces the risk of PDCCH interference. From LTE R11 onwards it is possible to handle CA with CCs requiring different timing advance (TA); for example, combining CCs from eNBs with CCs from RRHs. See Figure 8. One way to ensure that a UE is using both the best DL and the best UL carrier in a heterogeneous network is to use CoMP, introduced in LTE R11. With CoMP a number of transmission/reception points (i.e. 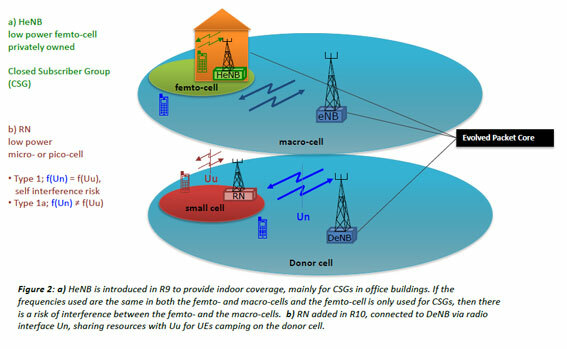 eNBs, RNs or RRHs) can be coordinated to provide service to a UE – for example, data can be transmitted at the same time in the same PRBs from more than one transmission point to one UE, or data can be received from one transmission point in one subframe and from another transmission point in the next subframe. CoMP can be used both in DL and UL. When CoMP is used in a heterogeneous network a number of macro-cells and small cells can be involved in data transmission to and from one UE. Especially useful in heterogeneous networks is the possibility for a UE in the cell range extension region to utilize the best UL in the small cell and the best DL in the macro-cell. See Figure 9. This, however, requires that the macro-eNB and the base station in the small cell are synchronized, and most likely it will require a combination of macro-eNB with RRHs in the small cell. Further enhancements regarding heterogeneous network and small cells are coming in future 3GPP Releases. At the time of writing, Release 12 is still in the process of being formulated with some features in the study phase and others, such as work on interference management for neighbour TDD cells, dual connectivity between the macro cell and small cells, mobility planning within hyper-dense environments and advances in carrier aggregation combinations already in the normative phase (specifications). Future updates to this paper will include what has been achieved with the completion of Release 12 during the second half of 2014.